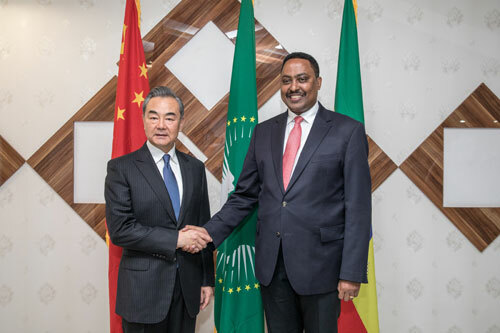 On January 3, 2019 local time, State Councilor and Foreign Minister Wang Yi held talks with Foreign Minister Workneh Gebeyehu of Ethiopia in Addis Ababa. Wang Yi expressed that Ethiopia is a major country in Africa and an emerging economy with development potential, and also an important strategic cooperative partner of China on the African continent. China-Ethiopia traditional friendly relations have withstood the test of international vicissitudes and enjoyed solid social and public opinion foundation. The Chinese side has always viewed and developed its relations with Ethiopia from a strategic height and long-term perspective, and will continue to unswervingly uphold the friendly policy towards Ethiopia. The Chinese side is willing to, together with the Ethiopian side, respect and support each other, constantly deepen political mutual trust, and expand mutually beneficial cooperation, in a bid to promote China-Ethiopia comprehensive strategic cooperative partnership for new development under the new situation. The Chinese side stands ready to provide support and assistance within its capacity for national development and improvement of people's livelihood of Ethiopia, properly resolve the problems arising from the cooperation through friendly consultations, and give full play to the economic and social benefits of major projects such as Addis Ababa–Djibouti Railway and industrial parks. The Chinese side is pleased to see the implementation of the outcomes of the Beijing Summit of the Forum on China-Africa Cooperation (FOCAC) in Ethiopia as soon as possible. Ethiopia is one of the first African countries to sign cooperation documents on the joint construction of the Belt and Road Initiative, and China's important partner of the joint construction of the Belt and Road Initiative on the African continent. It is hoped that the two sides will take the second Belt and Road Forum for International Cooperation to be held in China this year as an opportunity to further realize mutual benefit and win-win results as well as common development. The Chinese side is ready to, together with the Ethiopian side, strengthen coordination and cooperation in international and regional affairs, and safeguard the common interests of the two countries and developing countries. Workneh Gebeyehu noted that Ethiopia highly cherishes Ethiopia-China relations, regards China as the most important comprehensive strategic cooperative partner, and puts Ethiopia-China relations at the top place of Ethiopia's foreign policy. Like all African countries, Ethiopia appreciates China's adherence to non-interference in domestic affairs of other countries, and is benefiting a lot from China's stable and consistent foreign policy. Whether Ethiopia is during the period of smooth national development or in times of difficulties, China has given Ethiopia firm support, for which Ethiopia is deeply grateful. Ethiopia firmly believes that further developing Ethiopia-China relations is in full accordance with the interests of Ethiopia and its people. Ethiopia will always be China's trustworthy strategic partner. The Ethiopian side also hopes to continue receiving valuable support from the Chinese side in the process of Ethiopia's national development. Appreciating the cooperation initiative with Africa put forward by President Xi Jinping at the FOCAC Beijing Summit, Ethiopia hopes to benefit more from the outcomes of the FOCAC Summit, and welcomes more Chinese enterprises to invest in Ethiopia. Ethiopia supports and will continue to actively participate in cooperation under the Belt and Road Initiative. Ethiopia is willing to continue to intensify coordination and cooperation with China in the United Nations and other multilateral affairs to promote regional peace and development.